Fire is the element that threatens the people and land of south-central B.C.’s Thompson-Shuswap region in Gail Anderson-Dargatz’s 2007 novel, Turtle Valley. The author’s latest book is set in the same landscape, but this time it is water that figures prominently as a source of both life and destruction. On one side of the fictional Lightning River – once teeming with sockeye salmon, now drying up as a result of erosion, logging, and development – is a Secwepemc (known in English as Shuswap) indigenous community engaged in a land dispute aimed at protecting and restoring the river and the sacred salmon. On the other side are the Robertsons, a white ranching family whose 19th-century forbear, Eugene Robertson, settled the land and took Libby, a Shuswap girl, for his wife, with tragic results. Anderson-Dargatz cleverly reveals Eugene’s remarkable story alongside the present-day narrative, highlighting the multigenerational history of the family’s relationship to the river and its surroundings. From the teenaged Hannah Robertson, the river has taken much: her mother, her grandfather, and now – potentially – her brother, Bran. After falling into the river, Bran emerges altered. He is seemingly possessed by what Hannah’s Shuswap love interest, Alex, calls a “water mystery”: a myth passed down by Alex’s great-grandfather, Dennis Moses, who first appeared in Anderson-Dargatz’s 1996 debut, The Cure for Death by Lightning. To several characters in The Spawning Grounds, this powerful and determined river spirit appears in the form of a naked boy standing on the water. He has a mission to fulfill, and needs a body in which to do it. Hannah and her father, Jesse, struggle to accept the Shuswap myth of the water mystery, finding it easier to believe that Bran, like his mother before him, suffers from mental illness. A tension is established in the novel between these divergent perspectives; shrewdly, the author never fully resolves the ambiguity for the reader. This generally well-tuned novel slips into sentimentality at its conclusion, which relies too heavily on imagery suggesting rebirth and healing. 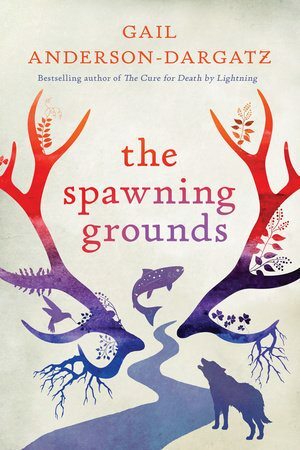 Nevertheless, The Spawning Grounds is a fine addition to Anderson-Dargatz’s ongoing efforts to mine a vein of rich and complex cultural geography.